Rosebud Llamas (formerly Rosebud Llamas Utah) is Now Located in Oregon! One-on-one Consultation - Same topics as above, but focused on your individual needs, including for behavior issues, individual training matters, conformation, care, selection of the right llama for you or the job, troubleshooting, etc. 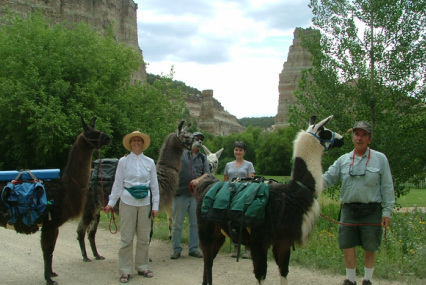 We got our first llamas in 1995 and three years later established Rosebud Llamas Utah with a vision of taking people great places with llamas. And we did that! 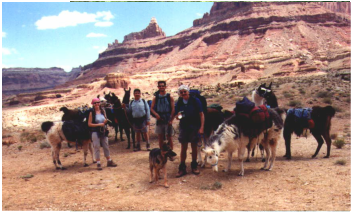 We personally guided fully catered pack trips with llamas in the San Rafael Swell, Browns Park on the Green River, and the South Unit of the Ashley National Forest. 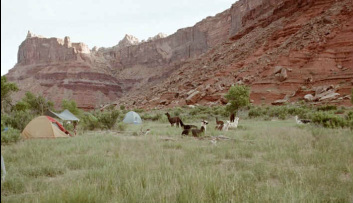 We volunteered our llamas for seven years to help cancer survivors hike Kings Peak, Utah's highest. We took groups of all sizes, ages, interests, and composition on catered day hikes in the mountains around our ranch in the Red Creek Canyon of Fruitland, UT. We taught workshops, clinics, and other kinds of learning experiences, including for Montessori Schools, the University of Utah's Lifelong Learning Program, and the International Sportsmen's Expo. We met wonderful people from all over the country, Canada, and even a group from England. And they met our llamas and learned what these fabulous animals are capable of in terms of athleticism, utility, low impact on the land, companionship on the trail, and their willingness, intelligence, and calm, gentle natures. In 2013, we decided to move to southern Oregon. We are now located about five miles north of Eagle Point, one mile up the Butte Falls Highway. Being new to the area ourselves and with our pack string getting on in years, we're not in a position to continue our outfitter-guide services here, but our love for, and understanding of, llamas go on. So we are focusing on activities that involve sharing our knowledge about, experience with, and enthusiasm for, llamas. As we drop "Utah" from our name, Rosebud Llamas is expanding our clinic options to share our knowledge, experience, and training techniques on just about any topic having to do with llamas you might have an interest in, except driving and fiber arts. We welcome ideas you may have for educational farm visits and can work with any group to develop a curriculum for clubs or school groups. We are available by appointment for in-depth one-on-one consultations by phone or in person. Ask us for other kinds of help you might need with your llamas . . . or alpacas, too. Please browse through our website and see where we and our llamas are headed as we enjoy our new home in Oregon! We hope you find something of interest! to a friend, family member, valued employee, etc. Drop us a note for more information from the "Contact Us" tab.